Refreshments, coffee and lunch will be provided. Columbia Bank and Nonprofit Association of Oregon are partnering for the 6th Annual Nonprofit Symposium in Eugene! Join nonprofit leaders, board members, and community members for a day of learning, networking, and discussions. This symposium is made possible with additional support and generosity of The Ford Family Foundation. The 6th Annual Nonprofit Symposium will begin with an interactive keynote presentation – Building the Connection: The Importance of Diversity, Equity and Inclusion – led by Hanif Fazal, Founder and CEO of the Center for Equity & Inclusion. Hanif will review critical components that must be embraced for diversity, equity, and inclusion work to take root in organizations. Learn what this work entails, why it’s important, and what organizations are doing to advance diversity, equity, and inclusion. This introductory session is for individuals who are beginning to explore advancing diversity, equity, and inclusion in their personal and professional lives. This session will build upon Hanif’s morning plenary: Building the Connection: The Importance of Diversity, Equity and Inclusion. The session will support participants in: building a connection and interest in DEI; exploring how the advancement of this work is both a personal and professional endeavor; and obtaining an introductory set of tools – definitions, agreements, and strategies that will help participants in navigating challenging conversations. This session is for leaders who are ready to enhance the culture of their organizations and will specifically focus on the role of leaders (very broadly defined) in advancing DEI. The session will be interactive and use case studies to explore what successful leaders in DEI are doing to be more inclusive, enhance the experiences of staff, and reduce disparities. This session will offer a deeper dive into the conversation Hanif starts in his plenary session. After the breakout sessions, all attendees are invited to convene for a robust discussion over lunch, which will be moderated by: Elena Fracchia – AVP, Wealth Advisor, Columbia Bank and Jim White – Executive Director, Nonprofit Association of Oregon. A nationally recognized facilitator, trainer, speaker and organizational development consultant, Hanif Fazal brings 20 years of experience, expertise, and commitment to advancing equity and cultural competency. In 2015 he founded the Center for Equity and Inclusion (CEI), an organization focused on advancing equity, diversity and inclusion efforts both locally and nationally. Under Hanif’s leadership, CEI has worked with leaders and staff in the nonprofit, for-profit, education, foundation and public sectors to integrate equity and inclusion principles and practices into all aspects of their organizations. Prior to forming CEI, Hanif co-founded Heart of Facilitation, a national facilitation training program for educators, social workers, and youth professionals. Additionally he co-founded the CEI Equity Certificate Program, a collaborative education initiative providing intensive professional development focused on equity and inclusion to educators across multiple school districts. A prolific speaker and trainer, Hanif has presented numerous times for conferences and groups locally and nationally. Most recently he has spoken at the Gates Foundation & Philanthropy NW's regional conference, been a two-time presenter at Courageous Conversations National Summit on Race, and was a speaker at SXSW and PGE Conference on Diversity. Melinda Gross’ background is rooted in 14 years of social justice work, advancing opportunities and outcomes for underserved communities. Prior to joining CEI, Melinda spent approximately 11 years working in nonprofit program development, including co-founding two nonprofit organizations. She has worked in a variety of roles in the nonprofit sector, including case management, policy advocacy, research and evaluation, fundraising, and organizational development. She also has lived experience as a woman of color, and as someone who has experienced poverty for most of her life. She brings a holistic approach to this work, grounded in and informed by her own personal experiences. 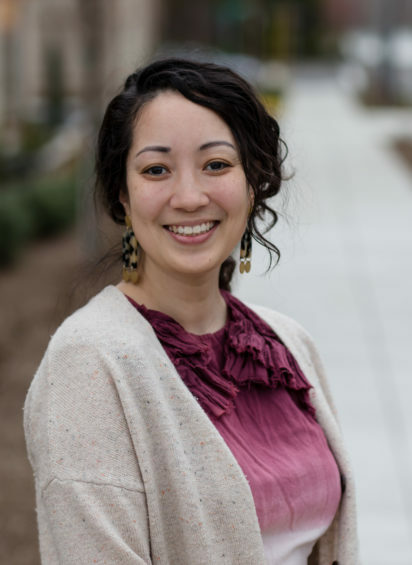 Melinda has 10 years of facilitation experience focused on transforming individuals and communities around issues of social justice, specifically racial equity and poverty. She served as the Executive Director (originally a founding member of the Board of Directors) for one of the nonprofits she co-founded. In this role, she facilitated poverty awareness training for organizations across the state, training over 4,000 Oregonians from organizations including school districts, healthcare groups, government agencies, and nonprofits. Her approach to facilitation not only generates awareness, but is focused on transformation and action. For questions about this event or assistance with registering, contact training@nonprofitoregon.org.